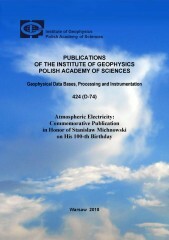 In 2017, a subtitle “Geophysical Data Bases, Processing and Instrumentation” was added to underline the fact that the Journal became mainly focused on experimental results from the Institute of Geophysics PAS and other scientific institutions. Also in 2017, after 55 years of being the Editor-in-Chief, Professor Roman Teisseyre resigned from this position, but agreed to support us further as the Honorary Editor. We are very grateful to this Outstanding Scientist for creating and managing this journal for so many years. The journal is mainly focused on the problems relating to geophysical data from the Institute of Geophysics PAS and other scientific institutions. The materials may be presented as individual publications or collections of papers (contributed volumes or special issues). We provide citable publication of valuable datasets and measurement results that may not be well-suited for traditional research journals. Our peer-review evaluates the technical quality and completeness of each publication. This will enable the data to be more widely available and properly cited. If you have any materials in the journal’s scope that are worth publishing, please submit a proposal.This call is addressed to a broad audience, not only to people associated with the Institute of Geophysics. Please fill-in our publication proposal form ( Publication_Proposal_Form.doc ) and return it to us.